The big Facebook news in day two's South by South West Interactive panel 'The Search for a More Social Web', presented by Dave Morin, Senior Platform Manager at Facebook, was Facebook Connect coming to the iPhone. But in the same session, Morin also announced another first: a Facebook client for the desktop. "Facebook Connect is not just about the web," said Morin, "it's also about the desktop. And as we think about how we create a more social web and more social experiences, the desktop is becoming increasingly important." Morin then invited Loic Le Meur, CEO of Seesmic, on stage to reveal the new client. "You can now go to seesmic.com/facebook and get the first desktop client for Facebook, which lets you share with your friends immediately on Facebook and read their responses," said Le Meur. "We're very excited to make this available for Facebook," he added. Seesmic for Facebook is based on the technology behind the company's desktop Twitter client Twhirl and, like Twhirl, uses the Adobe Air platform. Seesmic for Facebook runs on both PC and Mac, and the preview version is available for free download today. 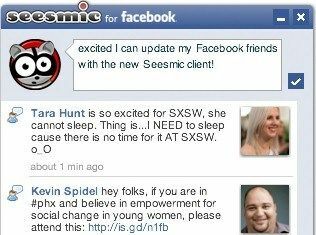 Seesmic says it will soon have a client with both Facebook and Twitter integrated into one application.